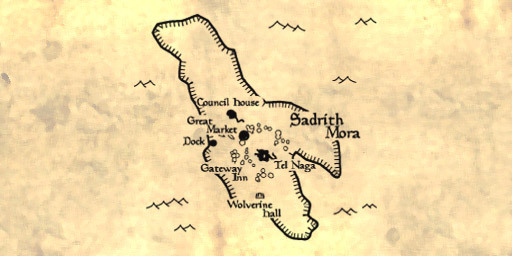 Sadrith Mora is the district seat of House Telvanni, and home of the Telvanni Council, though only one Telvanni councilor actually lives in Sadrith Mora. Sadrith Mora is an island settlement, and accessible only by sea and teleportation. The town is large, with many craftsmen, traders, and trainers, but it is open only to Telvanni retainers; outsiders should confine themselves to the Gateway Inn, and to Wolverine Hall, the Imperial quarters of the Legion garrison and guilds. The docks are in a sheltered bay on the western side of the island, and a trail leads up from the docks to the Gateway Inn. Beyond the Gateway Inn is the Great Market, with numerous craftsmen and traders, and a small slave market. North of the Great Market is the Telvanni Council Hall, a large orb supported by giant mushroom stalks. To the east of the Great Market is Tel Naga, the towering wizard-tower residence of Telvanni Councilor Mage-Lord Master Neloth. Outlanders can find services for the Fighters Guild, Mages Guild, and Imperial cult at Wolverine Hall. Members of the Thieves Guild congregate at Dirty Muriel's Cornerclub. Telvanni Great House and Tribunal Temple services are all housed within the Council Hall; additional Telvanni services are available in the Great Market district and in Tel Naga. The Gateway merchant inn is the only establishment with public beds. Members of the Fighters Guild, Mages Guild, and Imperial cults look for hospitality at Wolverine Hall. Telvanni kin and retainers stay at the Gateway, at Wolverine Hall, at a local cornerclub, or at Tel Naga. The Great Market has many services and tradesmen, and many others are scattered through town. There are two cornerclubs: Dirty Muriel's, for outlanders, and Fara's Hole in the Wall for local Dunmer. Tel Naga is Master Neloth's wizard tower. If you're not Telvanni or Telvanni retainers, you'll want to know Angaredhel, Prefect of Hospitality at the Gateway merchant inn, and Ery, Gateway's publican. At Wolverine Hall, Hrundi the Nord is the Fighters Guild steward, Procyon Nigiliusis [sic] is Mages Guild steward, and Aunius Autrus is the Imperial cult priest. Big Helende, the Thieves Guild Boss, makes frequent appearances at Dirty Muriel's Cornerclub. Telvanni wizards and retainers visit the Council Hall to confer with the Telvanni Mouths (Telvanni Mouths are spokesmen for their councilor mage-lords) Felisa Ulessen, Galos Mathendis, Arara Uvulas, Mallam Ryon, Raven Omayn, and Dalyne Arvel, Telvanni Council clerk. Councilor Mage-Lord Master Neloth lives in Tel Naga, the wizard tower in the center of town. Sadrith Mora is an island; there's no road or bridge to the mainland. To visit the mainland, you must either be able to fly, swim, or water-walk, or you must rely on shipmasters at the docks or the guild guide at the Mages Guild. Gals Arethi at the docks offers ship passage to Ebonheart, Tel Branora, Tel Mora, or Dagon Fel. Iniel at the Wolverine Hall Mages Guild can teleport you to Ald'ruhn, Vivec, Caldera, and Balmora for a modest fee.